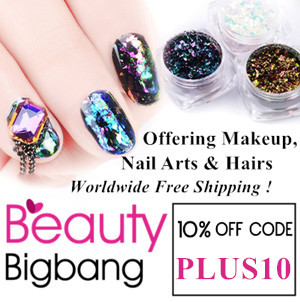 Plus10Kapow: Mani X Me Monthly Express Kit March 2019 Aloha, Beaches! 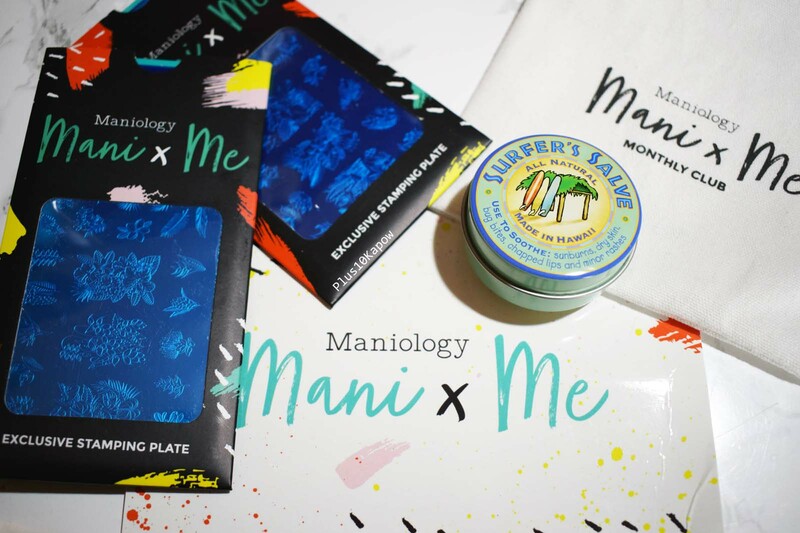 Mani X Me Monthly Express Kit March 2019 Aloha, Beaches! Hi. My name is Chrissie and I have no idea what to do with flowery stamping plates! Which is very annoying because the plates in the Aloha, Beaches Mani X Me box are so bloody pretty! 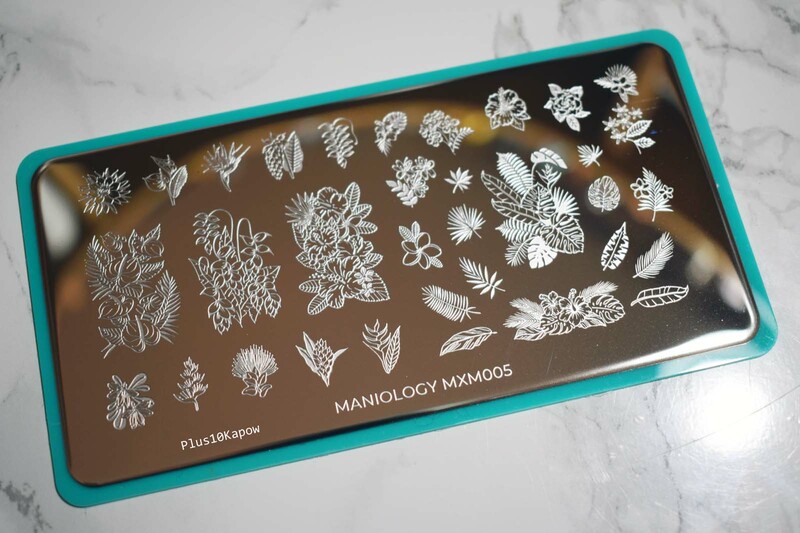 So Maniology are based in Hawaii, which is kind of cool and makes a lot of us, I'm sure, pretty jealous. 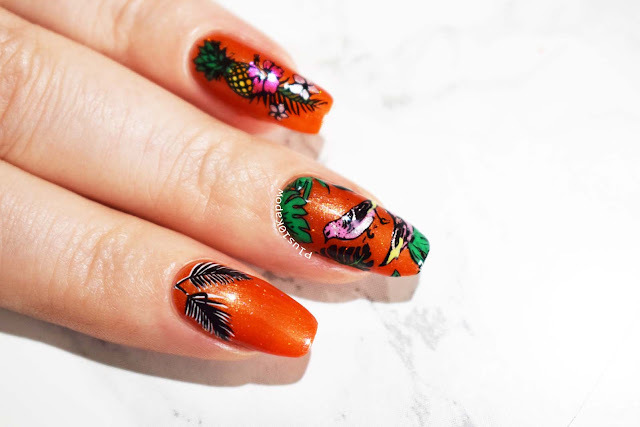 So this month, they decided to give us all a taste of paradise with some Hawaii themed plates and, if you bought the main Mani X Me Monthly box, 2 Hawaii inspired polishes. 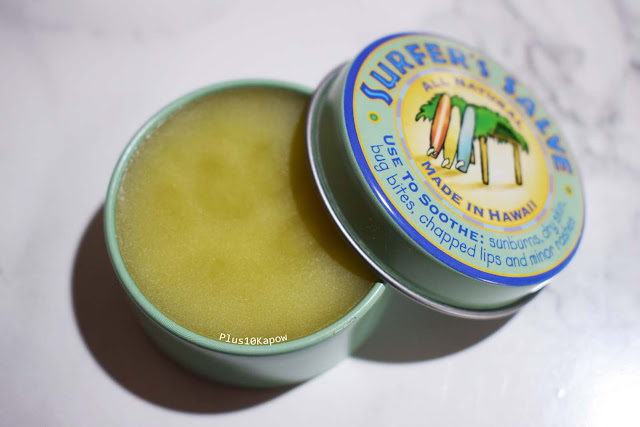 The extra this month was a pretty decent sized tin of Surfers Salve. Lets have a look at my terrible attempts at using these beautiful plates. 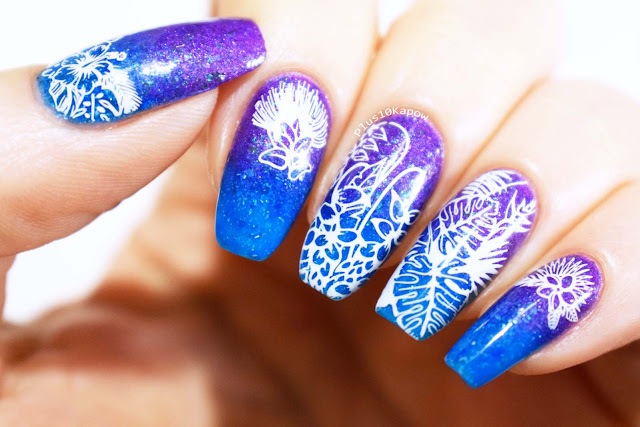 First look I really wanted to do a pretty gradient and a white stamp, so I used Wikkid Polish Lavender and Danglefoot Nail Polish Shake Your Tail Feather (I think) and stamped using Moyou White Knight, then I topped with Seche Vite. 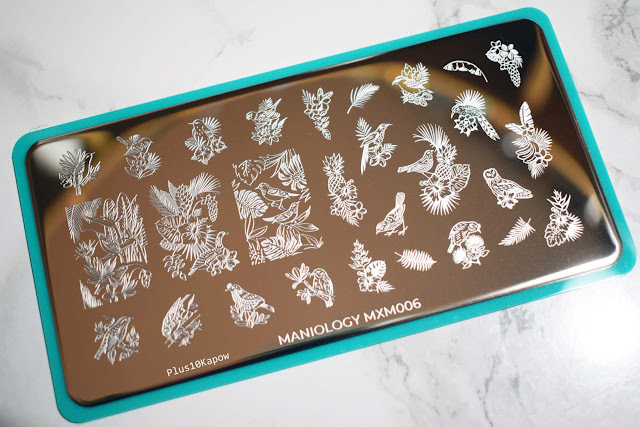 This is the MXM005 stamping plate and it is packed full of flowers and leaves. 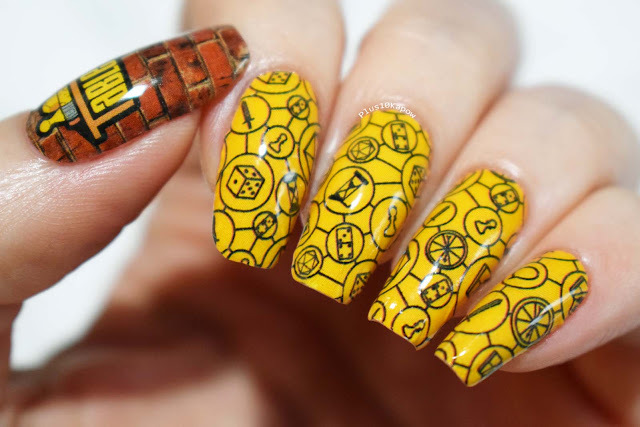 There are 4 full nail images and 30 smaller images. There are no imperfections and the images are etched perfectly. I got perfect pickup every single time. 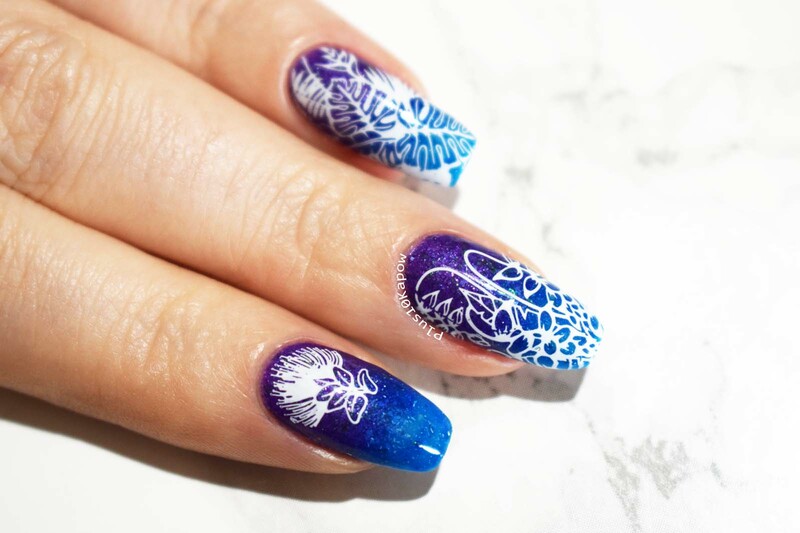 For my second look I wanted to do a reverse stamped mani and I wanted it to be vibrant. So I chose Moo Moo's Signatures Cinnamon Fluffball for the base. Is this making anyone else want some orange pop? I feel absolutely parched with my need for it. And this is MXM006, which is packed full of beautiful bird images and flowers. I know I should have concentrated on bird images for the mani but I was immediately drawn to the images that have pineapples in them. LOVE THEM. This plate has no imperfections and is etched perfectly, with perfect pickup every time. 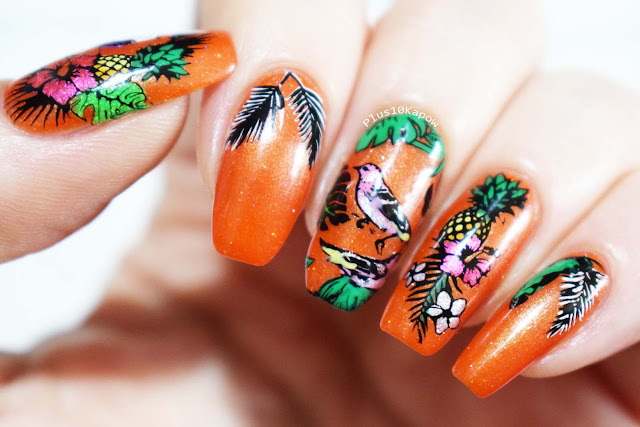 I agonised over these mani's. I tried a few different manis before these 2 and they all looked terrible. I don't know what it is but I see flowers and I am just frozen and confused. It's almost like I forget everything I know about nail art and stamping. But if I am honest with myself, these 2 manis are pretty passable. I was quite excited about this little tin here. My lips get super dry all year round and I bit them when I am in a state of anxiety or stressed, which is all the time really, but when it comes to giving my lips a little bit of love, I always prefer to go for the tins of stuff these days, usually Vaseline, so when I saw this I was quite keen to try it. Called Surfer's Salve, this is made in Hawaii by Island Soap & Candle Works and it is made with all natural ingredients. It can be used on sunburn, dry skin, bug bites, chapped lips and minor rashes, so I have tried it on my lips, one of my scaly eczema patches on my arm and on my cuticles, and it works great. It is super hydrating and smells great. So what did you think of the March Mani X Me box? The fab news is that you have until the end of the 22nd to sign up and still get this box, so head here for the standard box or here for the express kit get signed up now and don't forget that if you use code PLUS10KAPOW on either, you will get $5 off your first month. If you are already subscribed but haven't used my code before, you can get $5 off your next month by logging in to your account> click on "Manage Subscriptions"> click on "Subscriptions"> click "Apply Discount Code", enter the code and click "Apply". 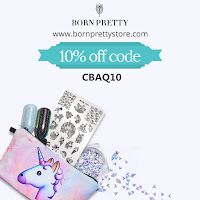 Don't forget that you can also use my code for normal store purchases to get 10% off your order. Sign up anytime after the 22nd and you will receive next month's box as your first, which will be, not only dinosaur themed, but 80's dinosaur themed!! !